Or as low as $350.00 per month over 12 months. Apply Now. 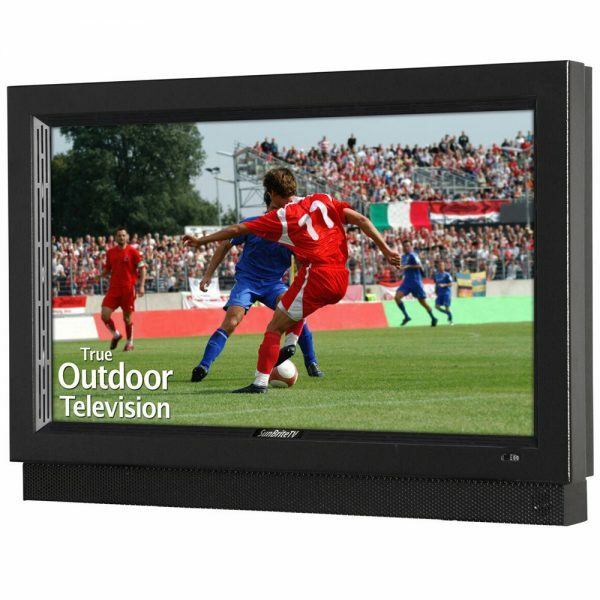 SunBriteTV 32″ Pro Series Direct Sun Outdoor TV(Black): This 32” Pro Series Direct Sun Outdoor LED HDTV is water-resistant, resilient, and durable—guaranteed to function safely and effectively in a wide variety of elements including rain, snow, extreme heat and cold, dust, salt air, and beyond. A tempered glass shield protects the LED screen in active environments, while direct sun readable EST technology helps guard against isotropic blackout. Its powder-coated aluminum exterior shields internal components while the ultra-bright, 32” full 1080p HD / LED anti-glare screen delivers exceptional outdoor viewing quality. A built-in heating and cooling system allows the display to operate in temperatures from -40 F up to 122 degrees F. Made for permanent outdoor installation. Indoor TV manufacturers specifically prohibit outdoor use (just check the manual). Installing a display that is independently certified safe for outdoor use helps protect homeowners from harm and installers from liability. SunBriteTV Pro Series TVs are designed for full sun or active areas. Enjoy the big game even on the sunniest of days. This device is direct sunlight readable, featuring high-temperature Enhanced Solar Tolerance (EST) technology to help guard against isotropic blackout—those annoying dark spots that could appear over the screen when it faces the sun. A tempered glass shield protects the LED screen in active environments. Indoor TVs are designed for lower indoor brightness levels and often feature a high-gloss finish, which can make for a poor outdoor viewing experience. SunBriteTV Pro Series TVs have high temperature tolerant, ultra-bright, professional-grade anti-reflective screens to deliver clear images in brighter outdoor lighting conditions. Made for permanent outdoor installation, the elements have nothing on the durability of this TV. Outdoor safe, water resistant, and resilient—a powder coated aluminum exterior protects against rust while shielding the internal components from rain, snow, dust, insects, humidity, and salt air. Extreme Temperature Functionality: A built-in heating and cooling system allows SunBriteTV Pro Series TVs to operate efficiently in extremely low and high temperature environments (-40 degrees F up to 122 degrees F). Cable hookups are easy with SunBriteTV’s weatherproof cable entry system. Thick gaskets form a compression seal around cables, and the media compartment can accommodate many types of media players and baluns. Equipped with RS232 Serial Control with discreet On/Off and Input. A rear IR receiver located in the cable compartment keeps IR emitter hidden and protected. The weatherproof remote puts the power in your hands, while a remote lockout feature prevents unauthorized users from changing programming. A weatherproof, detachable 20-watt soundbar is included (top or bottom mountable). Don’t forget the weatherproof mount. Outdoor-rated mounting options include both tilt and articulating styles, deck poles, ceiling mounts and tabletop stands. (O. -mode with power applied) The non-operating temperature feature requires power to be applied.